hacking out instant designs ! (Of course, post-event I know that her Drawing ‘Automatic’ Pattern Repeats tuts eliminate all that heartburn & I’ll be internalizing it for future). 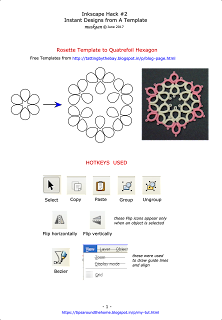 So, anyway, with just a few hotkeys and her Rosette template (6 outward facing rings), I created Instant Trefoil & Quatrefoil Patterns ! And went about tatting the latter, too. This is just the tip of the creative berg - choose and move around templates & motifs ! See how easy it is to ungroup and rearrange individual motifs. One does not need an advanced knowledge of diagramming or Inkscape here. Although clicking on images will enlarge them, here it is in pdf for easy reading and reference. The top left on p3 is a hexagon from trefoils. This skeleton is converted into a working tatting pattern diagram - a simple 2-round snowflake - with the inclusion of chains and picots. In the alternate method shown below with quatrefoils, more steps have been eliminated by working with a set of 3 motifs & flipping it! I draw my own guide lines using the grid and a bezier. Actually this was to be the 2nd hack I intended to share, because many of us still find using the guide lines and snap commands confusing. But for those who can, use the actual guide lines. 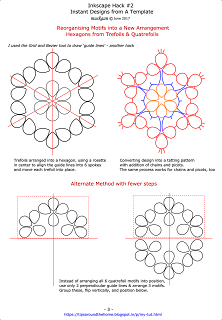 Errr, tatting wasn’t as instant as designing – the first ‘hexagon’ turned into a square (the one with tails)! Just a slight stichcount tweak, and I got a square, pentagon And hexagon all from One skeleton diagram (on the left) !!! The picots & joins were shifted in the pentagon & hexagon on the right. It creates a visibly different look, but the hexagon refuses to lay flat. Incidentally, all rings throughout have 24ds. And there's another possible pattern on p4 with quatrefoils and thrown rings, but the quatrefoils are 'inverted' ! I think it can be accomplished in one pass using SCMR with thrown inner rings and split rings along the outer circle. Now the Quatrefoil Square & Hexagon seem to be pretty basic, although my searches did not throw up such a medallion. And even the stitchcount – I came up by myself. If you have come across an exact replica, please do tell. I will share this pattern & it's myriad design possibilities next time. These different shapes seem to have a nice fit to create a larger fabric. Hmmm, a magic square, too, perhaps :-D No harm aspiring, is there - & I might just have got the sequence! In the meantime I'm halfway through a bookmark & next a coaster tatting it in one pass. tatting or drawing – the name of the game is fun ! I’m forever playing catch-up with my blog posts; this time, too, it is ‘in vein’ :-D That did not stop me from taking a much-needed net break. Not in vain! Spent some relaxed de-cluttered time tatting a lot (which means more catching-up ;-P) and watching another net - the grass court season in tennis ! I'm sure this is Federer's swansong year and wouldn't want to miss his matches. And what a match the Halle final was - a glorious Master Class !!!! In my previous post, I was asked how the veins were joined to the leaf. Posting a pictorial showing my ‘hack’. 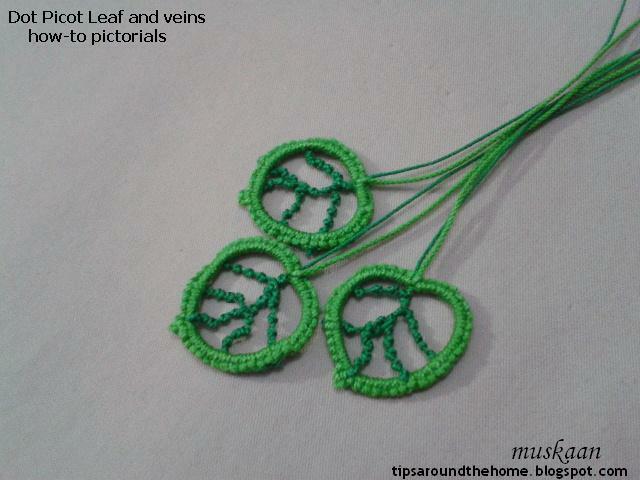 This freeform leaf is worked in size 20 thread, and the veins in size 40. I already shared how the leaf was worked, with 1 dot picot on ring at the tip, in this collage. Posting again to bring it all in one place. 1. What is ‘missing’ in the collage is that I started with both the leaf and the vein threads joined at the base as seen in this pic. The vein thread is merely 15-18 inches long. I used knotless method, but a weaver's knot can easily be used. 2. After completing the leaf to desired size and shape (it is not bilaterally symmetrical), I turn it over and work the veins from the back side, tatting over the tail in the first few dot picots. Vein is simply a dot picot string. 3. We make the middle vein first & when the desired length is reached, unwind thread from the shuttle and thread the end through a tapestry needle. 4. 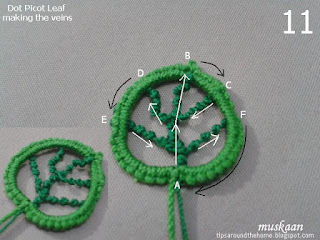 Insert needle at the tip (point B) - specifically at the base of the dot picot on leaf and …. 5. whip stitch under the caps on the right edge for a few stitches. 6. This is how it looks on the older leaves – invisible ! Despite the different shades, the dark green does not show up at all, only partly because it is thinner. 7. At desired point (point C) , I rewind the thread on to shuttle and tat the shorter vein. 8. When the required length is reached, pull a loop around the main vein, pass shuttle through and …. 9. tension carefully. Something like a lock join. It stays in place due to the notched texture. 10. Continue with the left side vein for required length and join to the edge (point D). With a needle, whip stitch along the left edge for next pair of veins. 11. Tat the vein, join to main vein & continue last vein which is attached to the right edge. I continue to whip stitch down this edge right up to the base. This pic shows how the entire pathway. Black arrows depict whip stitching. 12. This is how the leaves look from the wrong side. These measure just about 1 inch. This effect can be used as a filler for any ring or mock ring ! Fancy some petals, wheels, et al ?! The leaves are freeform, asymmetrical, & I eye-balled everything. If you wish, you can draw a sketch-to-size as reference. Remember this rustic leaf sketch turned into tatting ? the dot picot on chain, on ring, and now a string ! Who would’ve thought that the dot picot could evolve so quickly, defying it’s initial definition of a 1ds ring thrown off a chain. In May I figured out how to work a dot picot on a true ring. And now Usha comes up with dot picots on bare thread - the dot picot string! Pretty quick considering an evolutionary timeline. This bouquet consists of all 3 basic types of dot picots. When I was asked to test tat the Exotic Pollen , I jumped at the opportunity – it is such an elegant pattern ! The inner round was a bit fiddly in my stubby fingers, and overlapped a bit. And I forgot to join one of the inner petals. But once the outer round was tatted, it lay flat and nice. TIP : Instead of joining the pollen string to base of ring, I encapsulated it within the last half stitch of the ring, and closed ring. This was easier to work than fiddle around trying to find space in the base. I ran out of thread on the pale yellow one, & had chosen a brighter yellow for the outer round, but this looks cute as is. I was, still am, undecided how/where to use these motifs, hence left the tails unhidden. Any ideas ? from leaf to stem ! This cluster of flowers needed some greens. I started with a string of dot picots, joining back at a distance, to create the veins of a leaf. The leaf ring was to be attached to the tips. The working was fine, but I didn’t get the desired leaf shape – the string, tatted in size 20, was disproportionately large for a small leaf (forgot to take a pic). Pulled off the core thread but used the folded string as a potential branched stem. This, however, gives an idea of the versatility of the dot picot string as the base of any pattern. It can even substitute regular chains in any pattern as Usha will soon show you (I hope). In the initial stages I had also shared an idea with her to create a double picot with such a string of rings - I never got around to it, though. This time, I tatted a complete leaf as a true ring, adding a dot picot for a pointed tip, in consonance with the flower petals. Then, using size 40 thread, I created the string starting from base to tip and around the leaf for the radiating veins in one continuous process. I think the finer thread and single veins look pretty good, no?! No stitch count – free-styled it. Lays flat. 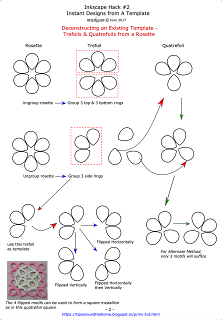 Dot picot is a 1ds ring (dot). Dot picot on ring is a loop tatted ring on ring (LTROR) and can be worked with single shuttle. It can be either decorative or functional. Dot picot string is a row of dots on bare thread, again worked with single shuttle. It is mainly decorative and also an alternate for regular chains. Many many thanks to Usha for sharing her lovely patterns & creativity! tell the world it's not easy! From now on we tell the world it's not easy. This delightful article was recently shared on Craftree. It Is true – we generally spend longer than we care on our projects. I usually do share my mistakes and all, but don’t like to make it a sob-story. This time, though, I stand by the title (no kidding, no fibbing, no embellishing) – this star did not come easy and I spent way too much time. I was inspired by Jane's star project to pick this up, and the fear that I'd forgotten how to make a daisy picot. And like her, I joined leaves which should've remained floating ! Too far into it to un-tat. Cut off and started afresh. I’ve done the daisy picot before. It’s pretty easy once we know how to hold and how to wrap stitches. But rarely used, hence easy to forget. This time I referred to Jon’s own pictorial – excellent directions ! A stroke of luck from Utah made me realise that I the daisy picot stitches are wrapped in what we termed Twist Work in Reverse Stitch (TwW rs) !!! Clearly I like to make my tatting life difficult! I've gotten addicted to directional (fs/bs) tatting. This star tested me to the limits. Not only did I have to refresh my daisy picot skill, but now I needed to tat them backside as well! AND join to adjoining trefoil daisy picot backside ! Managed somehow, with lots of retro-tatting. But what's a project without some challenge, right?! And I was adamant. Fortunately I was working with size 20 threads. In the discarded attempt, I started with the inner daisy picot trefoils frontside. The work progressed in counterclockwise direction, and joining to adjacent daisy picot was easy. In 2nd attempt, with inner trefoils being worked backside, and work progressing in clockwise direction, joining became difficult – it seemed like I was using “picot join to the right” methods. But it could just be some messing around with up and down picots. To eliminate the space between chains at base of daisy picot, I had to pull real tight, not always successfully. Should’ve had an anchoring vsp ! I slipped the yellow thread through the last half stitch of ring before closing in the hopes of keeping the 2 threads as close as possible. I think size of base ring (& thread size?) also has a role to play. For the leaves, I did not use SLT. 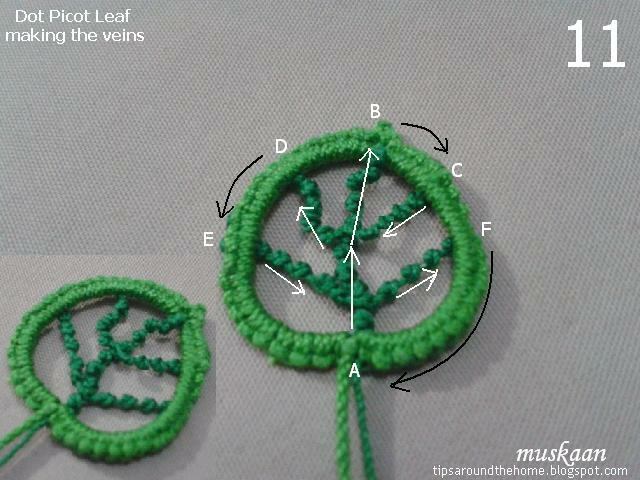 Easy to make the ‘8’ leaves without any SLT if the side chains face in opposite directions. The arms need careful attention for some unfathomable reason. Perhaps some design-induced mind games coz I faced similar problems with Marilee’s snowflake! easy or difficult, it’s happy tatting time always ! A situation arose where I needed to start an edging with a picot on a chain. No problem – go CTM and leave picot space with or without a holder (eg. paperclip)! But I was interested in making that edging in 2 colours and CTM was not an option. All the tutorials/videos known to me start with continuous thread and there is no mention of another colour. So here’s my solution to …. Ø Then add the other color for ring. Ø Tat over tails to hide. With this solution, I don’t need to start with any messy knots, colour blips, or bulk (hiding 2 tails under one chain, making it 4 threads!). And it is great for block tatting when we use 2 colours and have to start with a picot on chain! I converted it into a stepwise pictorial pdf (with introduction & links to a few resources) for relative beginners. 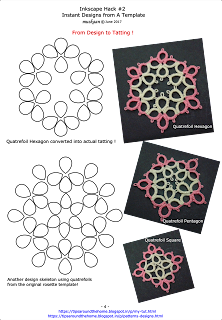 This tiny motif was made as I went along, for anybody interested in tatting along. There was another reason why this solution was needed. Here is a scan of the edging in 2 colours. BUT I made the leaves in same colour as stem whichmeant I couldn’t have the purple showing up at the starter and joining picots. More about that in a future post. This method also works if the chain is tatted in reverse stitch (unflipped stitches as in a split ring) ! But here, instead of ball, we will need a 2nd shuttle, because the tail acts as core, wrapped taut on our hand, and the shuttle makes the larkshead knots or reverse stitches. Ninetta is my “Hiding Lady” partly because of her numerous solutions to hiding ends! She gave me valuable and instant feedback on the draft I sent her. With her stamp of approval, I’m sure there is some merit to this solution J Grazie mille, Nin ! These were done earlier in the month, continuing with the theme of single shuttle medallions. This is a simple braid of half closed or half rings (HR), each of 15 stitches. In size 20 thread, I used a picot gauge of ⅜ inch for bare thread space of half-closed rings. Reverse work (RW) after each half ring so that alternate rings face in opposite directions. 8 half rings can be joined back into a square. 10 half rings can be joined back into a star or flower. Add picots for securing the inner rings, and decorative picots on outer rings. A pearl in the center of each half ring would look pretty for jewelry. This is made in 2 continuous rounds, with a rosette center and half rings (HR) around. A single shuttle split ring (SSSR) is used to climb out. Leave a tail at the start in order to secure the last SSSR*. * The last SSSR has to be joined to first ring, and I chose to do it Takeda-style, passing the starting tail through the SSSR loop before closing it finally. Tug on tail and then sew it under caps of ring to hide. One can use Dora Young’s split ring technique, too. Some SSSR tutorial links are listed here. Add decorative picots or beads as desired. These can probably make nice pendants & earrings ? I was hoping to make many more variations of the above, and more versions. But all that is taking a backseat. Tatting over tails is a common method of hiding ends when we start a project or when we add new thread. Continuing from the previous post where stepwise and comparative visuals demonstrated where to leave off the tail when hiding it within double stitches. 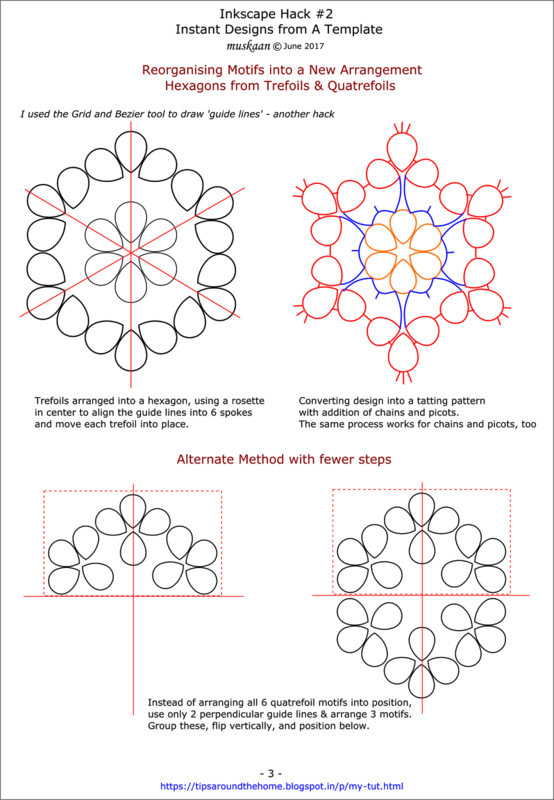 Part 2 demonstrates the same principle but in case of directional tatting, when we are working stitches from backside – where half stitches are in reverse order or sequence. Since tail was hidden in a ring in Part 1, this time we show it on a chain. SHS – second half stitch. RODS – reverse order DS, where sequence of half stitches is reversed. RW after ring made previously. We are now working from the back/wrong side. 1. Joining new thread (green/blue). 2. Start chain. 2 stitches (RODS) already made, encapsulating the tail. Starting the 3rd stitch with a SHS. Notice the position of tail – it lies to the ‘front’ of the stitch being formed. 6. Continue till 4 RODS and 1 SHS made. Then leave tail and tat 1FHS normally. NOTE : It is advisable to defer this step till a few more elements have been worked. Then pull the tails one last time and snip. 10. Tatting over tails frontside for ring and backside for chain, and leaving the tail in middle of a stitch, completed. leave tail in the middle of a stitch ! Stop tatting over tail between 2nd & 1st stitch when working a reverse order double stitch (backside tatting). as in 2nd side of a split ring or direct tatting.